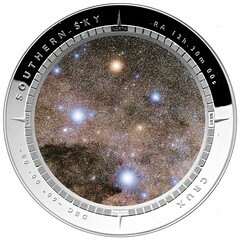 As an Astronomer interested in Numismatics, who did his PhD at MSSSO of Australia National University I found the Crux Silver Proof shown in http://www.ramint.gov.au/media/press-releases/2012/20120815.cfm an interesting coin design. However it would have been so much better if you had used a deep photograph of the Crux in the Sky like I illustrate in attached image. Your feedback has been provided to the Product Development team, who liaised with the ANU Research School of Astronomy and Astrophysics in the development on this product, and the final image was actually developed as a stylised representation of the constellation Crux taken from a sky map provided by the School. Regarding the Australian Mint’s curved coin: France beat them to this accomplishment with their 2001 silver coin commemorating The Last Franc. That unusual piece has a double curve and exaggerated legend intended to show the demise of the denomination. Attached is a crude picture. It is almost impossible to show its true character in a photo. The US Mint is directed to create a curved coin like the Australian piece in a pending commemorative coin bill. I don't remember what is being commemorated (it was in the news within the past month), but the bill says that this shape will be used "if possible." So now the Mint has to go out and acquire all kinds of new capability because some commemorative coin sponsors want to see something "unusual?" The Mint should tell them to get bent. 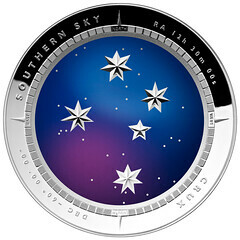 The Australian 2012 Southern Crux is an attractive coin. The not modern curved coin (schyphate) that I love is the ancient unit of the ruler ‘MDN BYN of the Himyarite Kingdom. They lived in what is modern day “Arabia Felix” from about 50-150AD. The cupped silver coin minted in Rydn looks like the attached. An example of a Byzantine scyphate you wrote about is attached. It is an electrum aspron trachy of Manuel I Comnenus and is Sear 1966. As to how they were made, there is no general consensus in the literature. Some propose that the Byzantine scyphate shape was formed or beaten into the die, others suggest that the struck coin was shaped. The coin shapers contend they see softness in the center of FDC level coins indicating a modification of the coin. I don’t see why that couldn’t also explain that the die was formed and the produced coins represent that weakness. Additionally I have several near-FDC coins that show no center softness in the image thus indicating that the die may have been formed as a scyphate and then engraved.